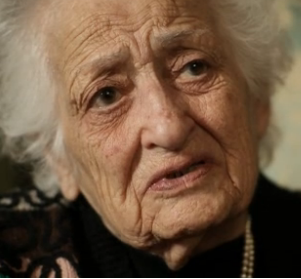 Astrid Aghajanian was a little girl when Ottoman Empire began it's systematic destruction of its Armenian population. In this testimony Astrid describes what happened to her father, and how she and her mother survived deportation into the Syrian desert. When I was a little girl, my father, they said they were going to take him as a soldier. My father came and kissed me and said, told my mother, ‘I know that they are going to shoot me, and you remember me by looking after Helen.’ My name was Helen. And they took him and they shot him. So my mother did everything to save me. She sold her rings, she sold her earrings, she sold everything that she could get bread and feed me. They came and told their mother that they are going to look after the children. My mother said, ‘No, I’m not going to give my child, I’ll look after her’. She saw the children piled up, one on top of each other and put fire around them and the children screaming, burning. It was horrible, she said, and she was glad that she didn’t give me. Other mothers starting crying, weeping, how their children were burning like that. It was horrible. When the Turks started slaughtering the Armenians, one after the other, the queue was reaching us. Mother looked around. She saw that there is no other way to run away. We are going to be killed. But my mother took me, and she buried me and herself under the dead bodies. So the Turks said, ‘We’ve finished them.’ They collected their horses and they went. My mother stayed with me under the dead bodies, fearing that they might be hidden and kill us. So we stayed there till the morning. In the morning she picked me up and she started walking in the desert. We walked the Syrian Desert. And the shoes got torn out. We started walking bare feet…. Imagine. I owe my life to my mother. She was a real mother. When she was walking she saw a Bedouin. He said, ‘Come with me.’ She said, ‘if you are going to kill me, I don’t want to come with you.’ He said, ‘No, no, come with me.’ So mother went with him. He saw a man with many camels, very rich. He spoke with the man, and mother saw him taking money from the man, and then he came to mother, and said, ‘Now go with him.’ He sold us. He sold us to the man. So mother had to go with the other man. She told him, ‘If you are going to kill me, I don’t want to come.’ He said, ‘No no, come with me.’ So she went with the other man. And their aim was to kill her, to throw her into the river. A shepherd boy knew about it. He came in the morning very early. He said, ‘Sister, sister, they are going to send you to fetch water from the river and throw you into the river and keep your child, don’t go.’ And in the morning the man poured the water out from the tank, and came and kicked mother and said, ‘Go and fetch water.’ She didn’t go. But mother knew that he was after her to kill her. And while she was working there I was a little child, playing in the garden. Opposite, there was a butler, and the butler called me. I ran to my mother and I told her, ‘That man is calling me.’ She went and saw him. The butler said, ‘Who are you?’ She said, ‘I am an Armenian refugee.’ He said, ‘Do you have relatives?’ She said, yes, and she would like to get in contact with her uncle who is in Aleppo to say that we are alive, we are not dead. That’s how we were saved. 24/04/1915 marks the date of the deportation of Armenian intellectuals from Istanbul, read the date to remember. For more information on the events of 1915-16, please visit the USHMM website.